I have a question to all of you,I did install a genuine tinted ws on my CBR but only after that I got a copy of the service manual, and it shows a totally different way to do it and looks a lot easier, please take a look at the instruction at this pic and let me know what you think. tks. Well after attempting to use this DIY to replace my stock windscreen with a new Hotbodies GP screen for the last 3+ hours I have finally given up in frustration after finding this tutorial to be woefully inadequate. The instructions after removing the instrument panel were not only confusing, but did not in any way resemble what I was presented with on my 2011 CBR250R. 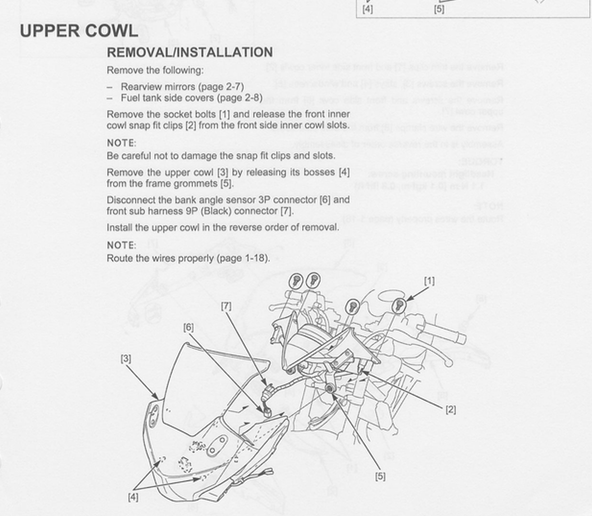 After spending way too much time trying to decipher the photos and instructions for removing the various screws to pull the cowl and apply them to my CBR, I THINK I've located two tappet screws that need to be removed, but I'm still not 100% certain since the pictures of that step only confuse the issue. In any case over an hour of trying to find a screwdriver (out of over a dozen choices) that could actually remove them without stripping them proved fruitless. The bike's frame completely prohibits getting a good angle on the screws and only increases the likelihood of stripping. The only possibility is to purchase a screwdriver with a flexible shaft that might be able to eliminate the problem of the bike's frame blocking full access to the screw head. If that doesn't work the I am completely (pardon the pun) screwed and will be forced to abandon the project altogether. Trying to find a better tutorial proved just as frustrating, as the lack of information on the web for removing the front cowl is practically non-existant. Numerous searches only turned up one, just as confusing, windscreen install DIY from Zero Gravity, which was similarly inadequate in describing the specific screws to be removed under the instrument cluster. So for now my bike sits in several pieces, unable to be ridden, until I can determine whether a specialized screwdriver can get me past this extremely frustrating roadblock. Obviously this is a task that is do-able and with the right DIY might even be fairly easy if not quickly done, but both this and the Zero Gravity tutorials have proved to be less than helpful. I wouldn't recommend attempting this modification using either of them, unless you really like wasting half a day using a lots of colorful expletives and getting nowhere. I feel your pain. I attempted to install a Puig windscreen on my 250 and didn't get far. It was a labour of pure frustration and I encountered a huge problem that halted any further progress. Two screws on the nose piece were on so tight any "oomph" on my part wld have cracked the plastic. Thus, I decided that my Powerhouse wld be the ones to finish the job. Sure enough the tech had to drill the screws in half to remove them. End of the day, the migraine headache level of the whole process was not worth my time. Not sure what Honda was thinking about re: the windscreen design is beyond me. Well it's certainly the most daunting windscreen install I've ever attempted. I don't think the stock screen was ever meant to be replaced at this point, but it's not the first difficulty I've encountered working on this almost needlessly complex machine. I'm confident I'll be successful, but it's very annoying to get halfway through a project with the bike in so many parts only to find that specialized tools are needed to finish. Luckily I labelled every screw as it was removed and now it's just a matter of finding the right flexible screwdriver set to free those tappet screws intact - and putting aside a 3 or 4 hour block of time to complete it since I'm sure this won't be my only unexpected delay. And what the heck if it does become too much of a PITA, I only paid $17.49 for the Hotbodies GP windscreen thanks to a 20% sale and $25 first order discount on their website. I am happy to report that I have been successful in installing my Hotbodies GP red tinted windscreen. The cowl is fully assembled and I only have to re-fit the side fairings to fully complete the project. Re-installing the instrument panel was the most difficult, but as others have said leaving the mounting brackets with a bit of "play" in them helps a great deal. DO NOT ATTEMPT WITHOUT HAVING AN OFFSET PHILLIPS HEAD SCREWDRIVER AVAILABLE! There is NO WAY you will be able to remove 2 of the tappet screws that hold the cowl covering and windscreen to the front sub-frame without possibly stripping the screws and driving yourself crazy without one!! As it was I still had to remove the screws unscrewing them in 1/8" increments because of the tight quarters. Maddeningly slow, but once I had that ONE TOOL the rest of the job was MUCH easier and actually do-able. Edit: 6PM and the fairings are on, everything works and it looks pretty good. On to the next project of installing my red OEM Honda CBR rim strips!! Last edited by TrueFaith; 06-14-2016 at 07:25 PM. They aren't blocked. Those posts are several years old and the URLs are probably dead by now. Not to mention the Photobucket debacle a while back where they replaced 3rd party hosted pics with place holders in an attempt to extort ridiculous membership fees to access your own photographs.